Looking to start radio advertising in Philadelphia to promote your business? Consider utilizing both digital and traditional radio outlets. The expansion of digital radio advertising, combined with advanced targeting techniques and clickable ads, provide one of the most effective advertising strategies in today’s market. More traditional forms of radio advertising in Philadelphia, like direct response ads, segment sponsorships, and host endorsements, continue to convert large local audiences and increase brand awareness. 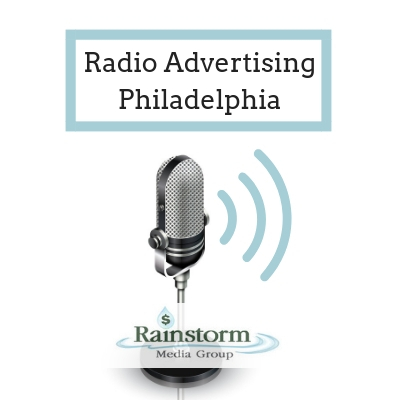 At Rainstorm Media, we work with our clients to leverage both of these platforms, creating some of the best radio advertising campaigns in Philadelphia. We combine local consumer behaviors, nationally-trending radio advertising techniques, popular radio personalities, and cost analysis strategies to provide our clients with a great return on their investment. Online streaming radio and music services have shaped a new paradigm for radio advertising. Online listeners are now able to click on an advertisement as it plays over the airways, in addition to tagging a company in social media, sharing contact information, and commenting on content. All of these engagement opportunities represent additional ways for our clients to connect more directly with their audience. Today, we use social media-based contests, email marketing, and text campaigns to create effective multi-channel marketing campaigns for a range of clients in Philadelphia. Most Philadelphians can name a handful of local radio stations and personalities. From the Classic Rock-focused WMGK to Philly’s hip-hop mainstay, WRNB, local residents are loyal to their favorite stations and use them to get their daily fix of news, tunes, and entertainment. This consistency and sense of familiarity offers an advantage for radio advertisers. Potential customers will hear your message multiple times, and associate it with the values and culture of the station. At Rainstorm Media, we help clients select the best station to carry their message and provide guidance on the best advertising styles to convince your audience. A recent study indicates that the return on investment (ROI) of radio advertising is around 1:6. That means that for every $1 our clients spend on radio advertising, they may see up to a $6 increase in profit. This ratio is competitive with the costs of running click-based ads on social media and search engines. However, there’s no one central factor that determines the actual cost of running a radio ad. In fact, a huge range of criteria drives the cost of running a radio advertisement in Philadelphia. For example, the time of day, length of the advertisement, the preferred station, whether the host is performing a live ad or a sponsored segment, and even the content of your ad all influence the costs. When it comes to digital radio advertising costs, there are additional factors to consider, like ad size, clickable features, and the varying costs of each streaming outlet. Don’t let this complexity deter you from launching a great campaign; Rainstorm Media specializes in strategic ad buying for radio advertising campaigns and can work to get you a great price. We look into ROI (return on investment) for each of our client’s campaigns and calculate the best way for you to spend your budget. Ready to start building your radio advertising campaign? Contact Rainstorm Media today. With some basic information about your business, goals, and budget, we can devise an effective strategy to help reach your monthly, quarterly, and annual sales goals. Get started today!